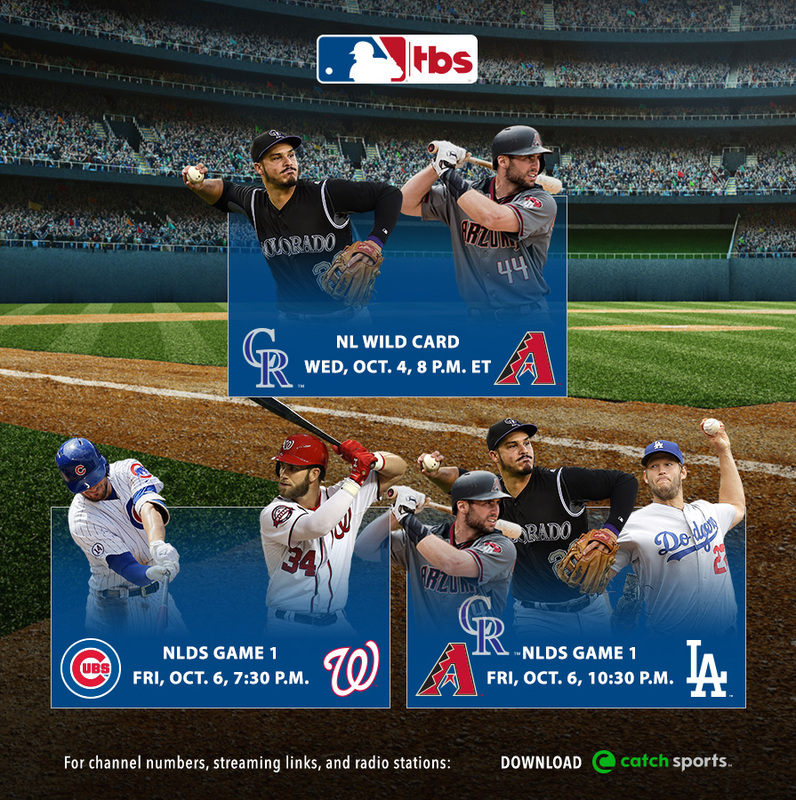 TBS will be the exclusive home of the National League throughout the 2017 MLB Postseason, beginning with National League Wild Card Coverage on TBS Presented by Hankook Tire - Colorado Rockies vs. Arizona Diamondbacks - Wednesday, Oct. 4, at 8 p.m. ET. The Rockies and their high-powered offense featuring Nolan Arenado and Charlie Blackmon will visit the Diamondbacks with ace Zack Greinke and MVP candidate Paul Goldschmidt, with the winner moving on to play the Los Angeles Dodgers. Sports Emmy Award winning commentator Ernie Johnson (play-by-play) will be joined by veteran MLB on TBS analyst Ron Darling and reporter Sam Ryan to call the NL Wild Card Game. The MLB Postseason Pre-Game Show on TBS will begin the network's postseason coverage at 7 p.m., featuring Hall of Famer Pedro Martinez, nine-time All-Star Gary Sheffield and 2007 NL MVP Jimmy Rollins joining host Casey Stern. The studio team will also offer postgame analysis on The MLB Postseason Show on TBS presented by the Lincoln Motor Company. • The network's exclusive coverage of the National League Division Series (NLDS) presented by T-Mobile will begin Friday, Oct. 6, at 7 p.m. with the MLB Postseason Pre-Game Show on TBS ahead of Game 1 of both of the NLDS. • At 7:30 p.m., National League division champions will meet in a matchup featuring the two most recent NL Most Valuable Players - Chicago Cubs and 2016 NL MVP Kris Bryant vs. Washington Nationals and 2015 NL MVP Bryce Harper. Johnson will be joined by Darling and reporter Ryan to call the Cubs/Nationals series. • In Friday's second game on TBS, the Los Angeles Dodgers and Clayton Kershaw will face the winner of the NL Wild Card Game at 10:30 p.m. Brian Anderson will call play-by-play for the Dodgers' series alongside analysts Dennis Eckersley and Joe Simpson, with reporter Lauren Shehadi. • TBS will also exclusively televise the National League Championship Series (NLCS) presented by Camping World, beginning Saturday, Oct. 14, with Game 1 of the best-of-seven series. • The NLCS will be called by Anderson and Darling, with Ryan. Due to the earlier and overlapping start of the NBA season, Johnson will be hosting TNT's Inside the NBA studio coverage during the NLCS. • Studio demonstrations will also include Sheffield giving a breakdown of generating launch angle in the batting cage.